Introducing the Lima Smart & Private Cloud Device. It is unlike any device seen before. It is packed with a wide range of options, and with it, your entire digital life can go with you, even without relying only on cloud technology. Every device you own will have simple access to your music, videos, photos, personal documents, and data. There is no need to manually synchronize, back up, and monitor your files. It’s a specific kind of technology that hasn’t been seen before, giving users a secure and easy way to keep their data organized. Files are readily available no matter if you’re on a tablet, smartphone, laptop, or desktop computer. Keeping track of all of your personal videos, photos, and files always seems to be a daunting task for some individuals. Knowing which device you saved a specific file or document to can be confusing and time consuming when you want to retrieve it. For this reason, many individuals are resorting to other options that are much easier to access, manage, and keep everything secure and in one place. Anytime you add a file to the Lima cloud storage device, it automatically keeps a copy of the file on the hard drive attached to the Lima adapter. That way, your files are both home and available to all of your other devices right away. 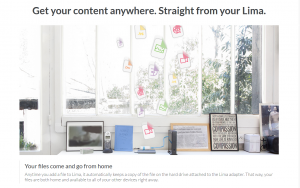 Lima calls its device “the brain of your devices.” Setup is simple, and once you’re connected, you’ll install the Lima app on all of your devices. It is able to run on Windows and Macs, Android and iOS devices.